As such, our model is primarily descriptive and communicative, and should not be read or understood as a normative blueprint. The starting point for teacher educators’ professional development should lie in teacher educators’ actual practice. The core elements and assumptions of our conceptual model are presented in the grey circles of our model. The starting point (outer circle in our model) for the professional development of teacher educators has to be their practice. Our assumption is that acting teacher educators have good reasons for doing their job in the way they are doing it. We call this a ‘practice-based approach’ as contrary to a blueprint approach. Our model starts from a positive appreciation of the practice in which teacher educators ‘enact’ their expertise. As InFo-TED, we do not want to compare individual teacher educators with a norm, fixed standards, or a list of competencies. In our understanding of research and our own experience in the field, we understand teacher educators’ practices as messages and reflections of their professional stance, and likely to include being critical and inquiry-oriented, self-regulated, contextually responsive, and research-informed. In our conceptual model, teacher educators’ practices are situated in the concrete context of the local teacher education institute and/or in the national or regional policy context. The local level refers to, for instance, the culture of the teacher education institute, the existing teacher education programs, or teacher education curricula. The national level refers to national policy measurements, existing frameworks, or standards for teacher educators. Finally, teacher educators’ practices are situated in a global level stressing their relation with supranational and societal change. As a next step in developing our model, we situated messages of teacher educators in what we called ‘dynamics of professional learning’. These are presented in the left-hand side of our model where we present a non-exhaustive list of possible content domains that we believe ought to be included in opportunities for teacher educators’ professional development. These domains are related to, for instance, social and technological change, diversity in society, communication and relations between teacher educators and different stakeholders, the multiple identities teacher educators have; and the broad visions teacher educators have about the nature and future of ‘good’ education. Our conceptual model further contains two arrows. The first arrow reminds us that thinking about teacher educators’ professional development means thinking broadly about teacher educators as both university-based and school-based. This arrow prompts an inclusive definition of teacher educators encompassing a wide spectrum of positions in the educational system and field and implies that we are aware that teacher educators enter the profession with different backgrounds. Some, for example, enter having been working as teachers, some as researchers with or without a PhD, and others may come from a variety of education-related roles. At the same time, this double-ended arrow implies that we stress the importance of thinking of teacher educators’ practice and professional development as situated in a temporal context that recognizes that teacher educators enter the profession at different moments in their careers—with different experiences and different learning needs. 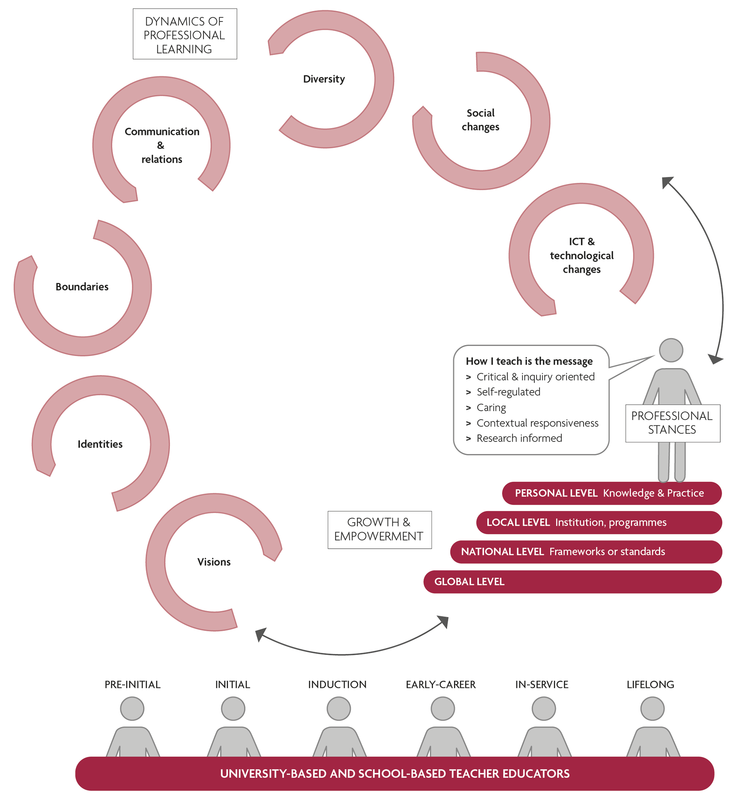 To conclude, the conceptual model that we have developed illustrates that our starting point for teacher educators’ professional development should lie in teacher educators’ actual practice. With our conceptual model we take a stance against a blueprint approach that would attempt to identify as well as assess professionalism via an exhaustive list of standards or competencies (knowledge, attitudes and skills) that teacher educators need to have in order to rightfully consider themselves to be ‘professional’. Contrary to this approach, the InFo-TED conceptual model starts from a full appreciation of the work teacher educators are doing and of the way they are doing it: their enacted practice.